The condo boom in Toronto continues – in fact, new condo sales are up 33% from last year. It seems that until now, much of Spadina has been spared from development. But this will all be changing. At least three big buildings are planned along Spadina between King and College. One made news this winter because a 20,000 square foot Loblaws will be part of the complex, which locals fear could kill Kensington Market. This is a 15 storey building right on the edge of the market scheduled to be completed in 2016. Kensington Market has survived for over a century, I suspect it will take more than a Loblaws to kill it. 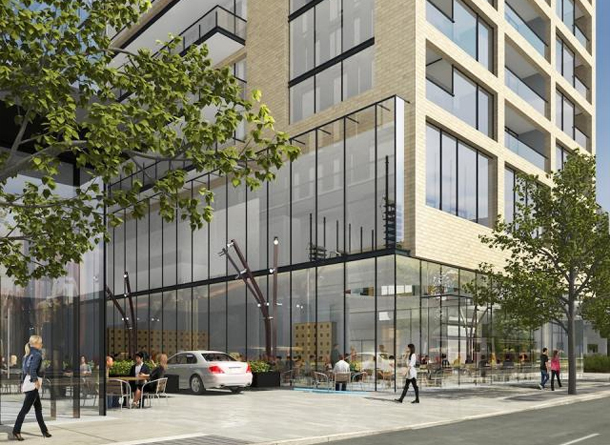 Another 19 storey condo building is planned for College and Huron, just east of Spadina. There are at least two issues with this development: there are 15 rental units that will be gone (although the plan includes replacing them and charging the same rent) but it also looks like at least one old building will be demolished to make room for it. At 19 storeys, it’s twice the height of the Centre for Addiction and Mental Health. Current zoning limits development to 16 metres, the proposed tower would be 58. We’ll know if this one is moving forward by the end of August. The third is planned for King and Spadina, just south of the one storey LCBO, which seems to have been built with a limited life span in mind. It makes no sense to have a one-storey structure there permanently. The building currently awaiting approval by city council would replace the Winners on the south east corner with a 36 storey building with retail facing Spadina Avenue and though it would be among the tallest, would certainly fit in with the cityscape.